Boris, whisky and Sikhs? Can you talk about alcohol in a gurdwara? What does the Guru Granth Sahib say about it? “I wouldn’t go there,” counselled Aaqil Ahmed, former Head of Religion (& Ethics) at the BBC and Channel 4, now Professor of Media at the University of Bolton. But go there we must, and it’s partly his fault that we do so, not least because of the paucity of attention paid by the media to Sikhism, especially that which is occasionally expressed by the ‘robust’ sort of Sikh who thinks he’s a Muslim. Or, in this case, ‘she’. Boris visited a gurdwara in Bristol and enthused about free trade and low tariffs, as you do in a gurdwara. He bumbled on about Brexit and the price of whisky: “I hope I’m not embarrassing anybody here by saying that whenever we go to India – Mumbai or to Delhi – we have to bring clinking in our luggage,” he said to the scattered tribes of India, for whom ‘clinking’ has to be accompanied by hand gestures so they might understand the white man’s meaning. “We have to bring Johnnie Walker, we have to bring whisky,” he reiterated for those whose grasp of English stretches to proper nouns. Boris bumbled and blustered a bit more, digging out some words of apology. And lo, news of Boris’s ‘gaffe‘ spread to the four corners of the earth, which isn’t exactly great if you happen to be Foreign Secretary. Even if wine is made from the water of the Ganges, O Saints, do not drink it (SGGS p1293). maanas bhariaa aaniaa maanas bhariaa aae. jith peethai math dhoor hoe baral pavai vich aae. aapanaa paraaeiaa n pashhaanee khasamahu dhhakae khaae. jith peethai khasam visarai dharageh milai sajaae. jhoot(h)aa madh mool n peechee jae kaa paar vasaae. naanak nadharee sach madh paaeeai sathigur milai jis aae. sadhaa saahib kai ra(n)g rehai mehalee paavai thhaao. One person brings a full bottle, and another fills his cup. Drinking wine, his intelligence departs, and madness enters his mind; he cannot distinguish between his own and others, and he is struck down by his Lord and Master. Drinking it, he forgets his Lord and Master, and he is punished in the Court of the Lord. Do not drink the false wine at all, if it is in your power. O Nanak, the True Guru comes and meets the mortal; by His Grace, one obtains the True Wine. He shall dwell forever in the Love of the Lord Master, and obtain a seat in the Mansion of His Presence (SGGS p554). But other Sikhs demur and drink freely, not least because we’re dealing here with translation, transliteration and contextual interpretation. It helps to be educated in Sanskrit and the Vedāntaśāstras to be able to provide sound exegeses of gurbānī. We are also dealing with distortion, not by brāhmanas (supplementary ancient Indian texts) but by Islamified neo-Sikhs. The Guru Granth Sahib is not the Qur’an; it is not a book of laws, prohibitions and strictures, as Balbir Kaur appears to believe: it is a book of devotion, of wisdom, of transcendence. 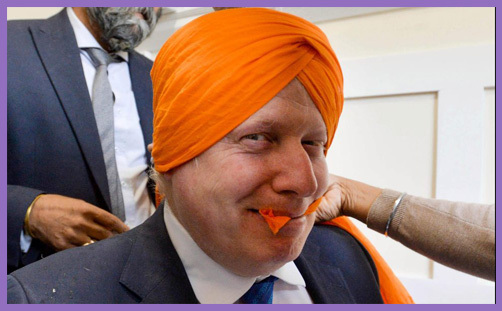 It is not forbidden to talk about whisky in a gurdwara (it’s not as if Boris was swigging the stuff), but the ignorant media dutifully propagated Balbir Kaur’s infallible dogma as Sikh orthodoxy and used it to humiliate Boris by making him appear foolish, ignorant and insensitive. That is the role of the religiously-illiterate media. Certainly, Ms Kaur may choose herself not to consume Johnny Walker, and she may be hyper-sensitive to the whole subject owing to alcoholism within her family. But her experience of self is not above that of the Gurus: they transcended the intellect to reach the wisdom of consciousness; she is confined by the formality of legalism and the rigidity of her ego. And here is a theme which Aaqil Ahmed might have explored when he was in a position to do so, for there is a fundamentalist, freedom-fighting, political strand of Sikhism emerging in the UK which is every bit as radicalised as a certain strand of Islam. Just visit certain gurdwaras and you might see pictures of gun-toting Sikh militia glorified on the temple walls. Educated, enlightened and peace-loving Sikhs daren’t try to counter this for fear of ‘community’ reprisal, which at least amounts to reputational slander. Far easier for the media (and police) to let it be, just like Balbir Kaur’s visceral temperance, which is obviously far more to do with her Tory-phobia (which is no doubt also mandated by Guru Gobind Singh Ji). Like all religions, there are different schools of thought in Sikhism with successive gurus contradicting and excommunicating each other in order to attain spiritual supremacy and the proliferation of their particular slant on truth. All would agree, however, that when consciousness is pure, nothing that enters the mouth can affect it. Jesus might have agreed (Mt 15:11).